Advance Tax - How to make Advance Tax Payment? 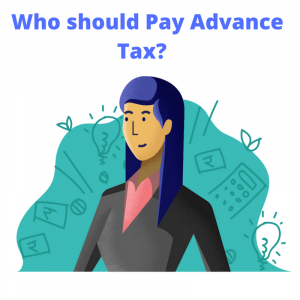 How to Calculate & Pay Advance Tax? Advance tax means income tax should be paid in advance instead of lump sum payment at year end. It is also known as pay as you earn tax. These payments have to be made in installments as per due dates provided by the income tax department. Salaried,freelancers and businesses– If your total tax liability is Rs 10,000 or more in a financial year you have to pay advance tax. Advance tax applies to all taxpayers, salaried, freelancers, and businesses. Senior citizens, who are 60 years or older, and do not run a business, are exempt from paying advance tax. Presumptive income for Businesses -The taxpayers who have opted for presumptive taxation scheme have to pay the whole amount of their advance tax in one instalment on or before 15th March. If they pay all of their tax dues by 31st March that will also be fine. Presumptive income for Professionals– The professionals, such as doctors, lawyers, architects,etc., opted for the presumptive scheme under section 44ADA have to pay the whole of their advance tax liability in one instalment on or before 15th March. Even, if they pay the amount by 31st March then it will be treated as the amount is paid within the due date. Read in detail about presumptive taxation here Want a CA to calculate and help pay your advance tax dues? Our CAs will calculate your advance tax liability so you can pay your dues on time. Using Amazon for Online Shopping? ClearTax E-filing service is also available on Amazon. Is an NRI liable for payment of advance tax? I am a senior citizen having pension and interest income. Should I pay advance tax? Resident senior citizens not having income from business or profession are not liable for advance tax. Will I be penalized if I do not pay advance tax? Non payment of advance tax will result in levy of interest under 234B and 234C of the Income tax Act, 1961. Can I claim deduction under 80C while estimating income for determining my advance tax? Yes. You can consider all these deductions while estimating your income for the year for computing your advance tax liability. You can still go ahead with payment of advance tax on or before the 31 March of the year. Such payment will still be treated as advance tax only. Advance tax payment is made using Challan 280 just like any other regular tax payment. You may read our detailed article on online payment of income tax. Know all about interest imposed under section 234A for late e-Filing of your Income Tax return. Find out how much interest to be paid in your case. Know all about interest imposed under section 234B for not paying advance tax. Find out how much interest to be paid in your case. Know all about interest imposed under section 234C for deferred payment of Advance Tax. Find out how much interest to be paid in your case. Learn about Advance tax and who should pay it. Find out how to calculate advance tax and due dates for payment of advance tax. What is Interest for Default in Filing your Tax Return? What is the Interest for Deferred Payment of Advance Tax?